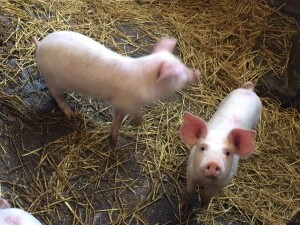 Home › Uncategorized › Learn about all things pig at Smallicombe Farm! Whether you’re a genuine pig enthusiast intent on learning more, or just have a gentle curiosity about these intelligent creatures, Smallicombe Farm can offer you a bespoke experience. 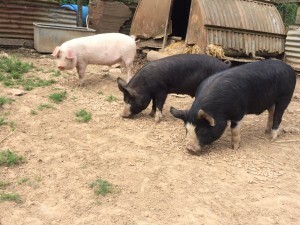 Ian and Maggie Todd have years of experience breeding and showing British Rare Breeds and still have fine examples of British Lop, Berkshire and Saddleback pigs in their small herd. You can book in for a course on Practical Pig Keeping, where you will be educated on all aspects of keeping weaners, from feeding, housing and fencing to all the regulations involved. Ian emphasises you should never attempt to breed pigs until you have first successfully raised weaners for the freezer and enjoyed doing so! Pigs need full time care and commitment and you must also be prepared for your pastureland to be destroyed! If you do eventually decide to breed, your ‘starter kit’ will comprise a couple of sows and a boar. They are large and powerful animals and should be respected as such. ‹ Scrub up in cow’s milk soap!